With the increased use of total ankle arthroplasty worldwide and many available prosthesis options, foot and ankle surgeons have turned their attention to the best course for revising these prostheses. Component exchange is sometimes possible, as is re-arthroplasty. 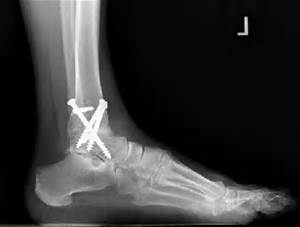 However, findings from a recent study in which investigators reviewed 140 patients who underwent primary total ankle arthroplasty (TAR) and two types of revisions showed that patients with TAR may have better outcomes with ankle fusion, should they require a revision. In an article in Orthopaedics Today Europeabout the study results, investigator Ilka Kamrad, MD, said patients who underwent ankle fusion had similar function to those who underwent revision TAR, and both groups showed similar levels of satisfaction. “Revision total ankle replacement does not seem to be superior to ankle fusion after a failed primary total ankle replacement, but larger study groups are needed to better compare the outcomes of the two procedures,” Kamrad said during his presentation at the American Academy of Orthopaedic Surgeons Annual Meeting.